The Indian women's hockey team failed to break its 36-year-old gold jinx after losing to Japan 1-2 in a keenly contested summit clash to settle for the silver medal at the 18th Asian Games, in Jakarta, on Friday. 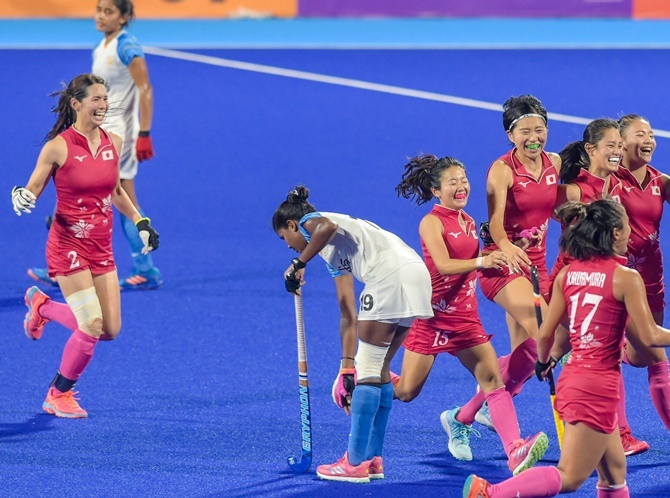 Minami Shimizu and Motomori Kawamura scored for Japan through penalty corners in the 11th an 44th minute while Neha Goyal's field goal in the 25th minute was the lone strike for India, who were aiming to win their first Asiad gold since 1982. The Indians had qualified for the final of the Asian Games after a gap of 20 years gap, having beaten China in the semifinals. For Indian hockey, there was more disappointment after the fancied men's team failed to defend its gold following their loss to Malaysia in the semifinals on Thursday. Another Japanese counter attack followed which resulted in their first penalty corner which was clinically converted by Shimizu in the 11th minute. In the 36th minute, a skilful one two from Vandana Katariya and Navjot Kaur almost got India the lead but Udita's shot was saved by the Japanese keeper. The Indian women, like their male counterparts in the semifinals yesterday, were guilty of holding on to the ball for far too long while the Japanese operated with quick passes. India withdrew their goalkeeper Savita with two minutes remaining as India desperately pushed for an equaliser. They even got two chances with 40 seconds left on the clock but failed to find the Japanese net.